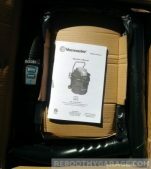 The VacMaster VWM510 vacuum cleaner and its wheel kit arrived in two boxes at the same time, about 5 days after I placed the order. 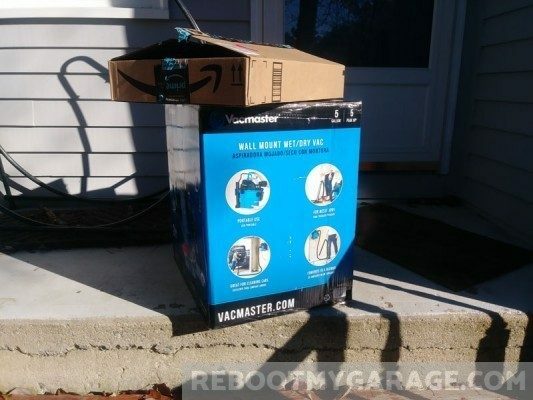 It was an absolutely beautiful October day so I was delighted to do the vacuum cleaner unboxing right away. Moonlight and Sunshine helped inspect the goods. Is the VacMaster VWM510 as good a vacuum cleaner as my research led me to believe? The unboxing, assembly and installation were incredibly easy. 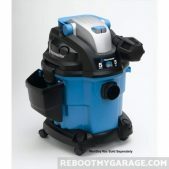 The machine has well-designed on-board accessory storage, a blower and a wet-vac function. The vacuum cleaner hangs neatly on the wall, but I can also pull it off to use the wheels. I have 20 ft. of cord, 21 ft. of hose, and a remote on-off switch. 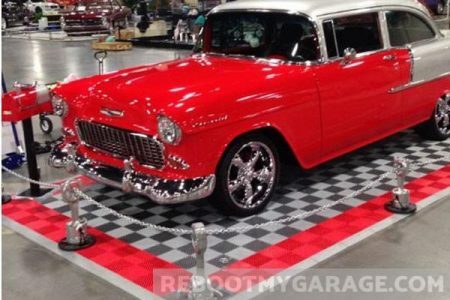 I love this vacuum cleaner for my garage. 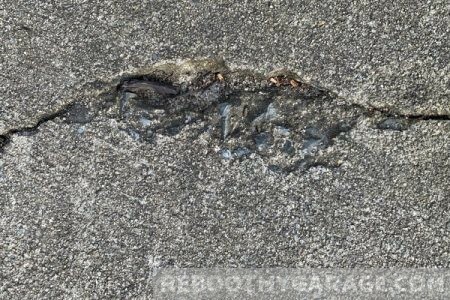 What is the best shop vac for cars? 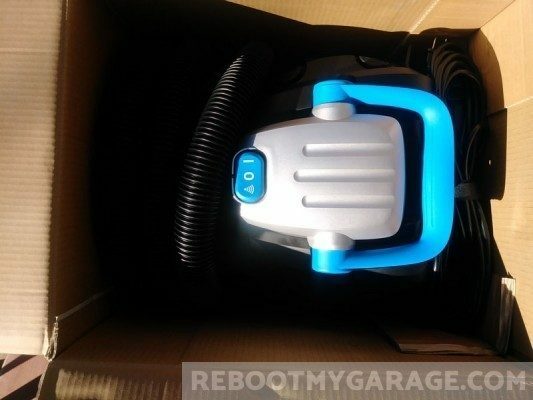 I created a set of features I wanted in a garage vacuum cleaner. My next vac had to have a blower, a wet-dry function and be wall-mountable. I also wanted a long hose and wheels. 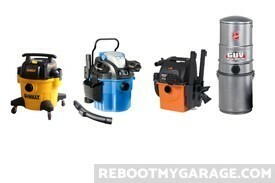 I compared the VacMaster VWM510 vacuum cleaner to nine other VacMasters. 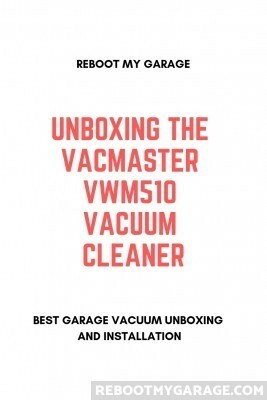 The VWM510 rose to the top as the best VacMaster vacuum cleaner for the garage. 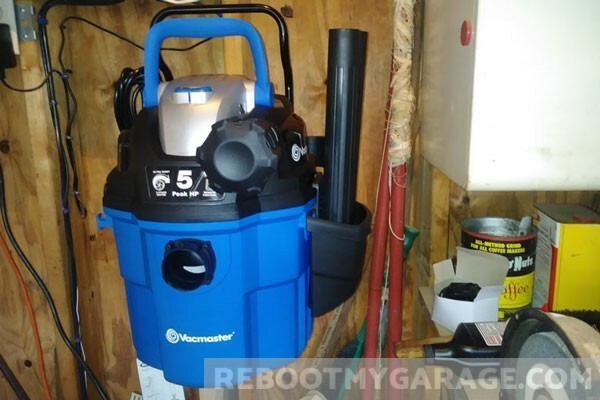 Then I compared the VacMaster VWM510 to a Bissell, a Stanley, a GarageVac, a DeWalt, a VacuMaid, a Hoover, four Shop-Vacs, two Workshops and two Ridgid garage vacuums. The VWM510 beat them all. I then ordered the VacMaster VWM510 on Amazon. I also ordered the separate wheel kit. 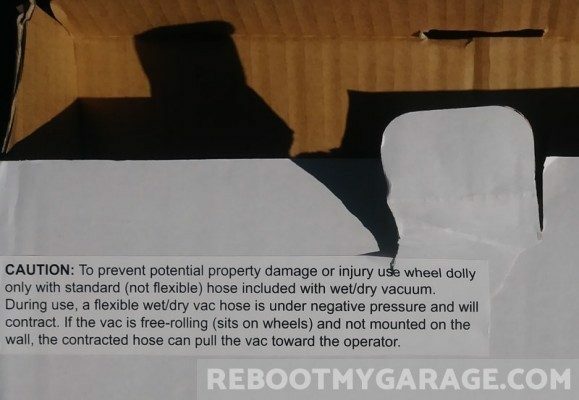 Unboxing label: To prevent potential property damage or injury use wheel dolly only with standard (non flexible) hose included with wet/dry vacuum. During use, a flexible wet/dry vac hose is under negative pressure and will contract. If the vac is free-rolling (sits on wheels) and not mounted on the wall, the contracted hose can pull the vac toward the operator. I wanted the vacuum cleaner on wall (and off of the floor). But I also wanted wheels for using it as a wet vac. And the wheels are good for just general portability. Without wheels, I was going to have to carry it, which would be way too annoying for my old back. Both the machine and the wheel kit showed up in 5 days. The dogs wanted to stay outside, so we started the unboxing. The VWM510 was well-packed. 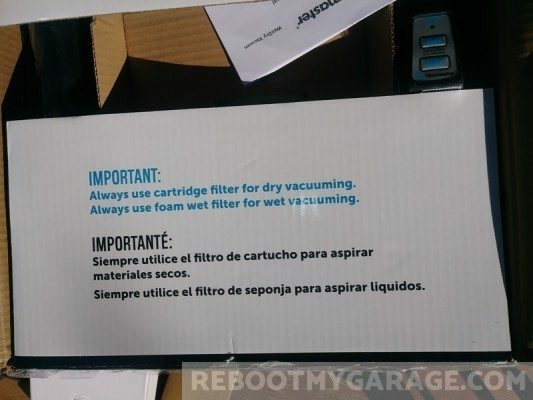 The box warned me to use the foam filter for wet vacuuming and the cartridge filter for dry vacuuming. 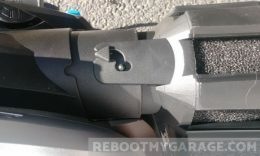 The dry-vac cartridge was already installed in the motor head. The motor had a nice, sturdy plastic handle that also bent down out of the way. Another label warned me not to use the flexible hose while wet vacuuming. 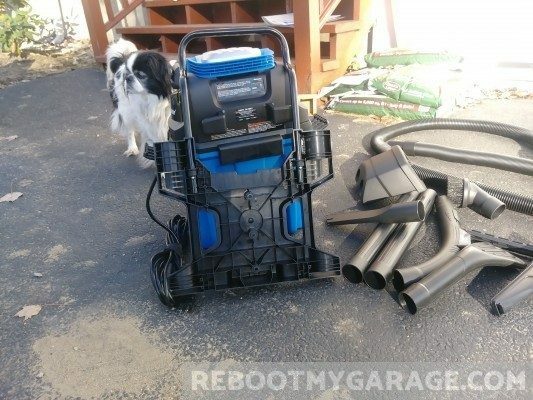 The VWM510 comes with two hoses. One is more rigid, the other is more flexible. They hook together for a total of 21 ft. of hose length. Only the more rigid hose should be used when performing a wet vacuum. The flexible hose responds to the negative pressure by creeping up on you and asking to borrow the car hitting you in the leg. The user manual was clear and easy to read (even without my glasses). I compared the parts to the parts list. Everything looked good. 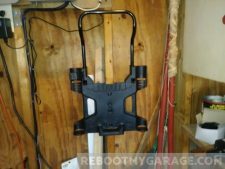 I had the bracket for wall mounting; two hose extensions; the flexible and the rigid hoses; the double-use floor accessory (wet and dry); the upholstery tool and the brush tool. 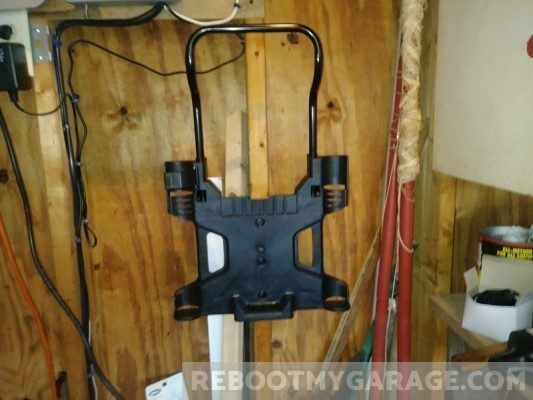 There was also a side attachment to hold the vacuum accessories, and screws to hold the mounting bracket on the garage stud. The power cord was nicely wrapped behind the machine. After I pulled the motor and dry cartridge out of the bucket, I found the foam filter and crevice tool. Doggie Inspector Moonlight approved, so we proceeded. The assembly instructions were mostly clear. But I’m not the most mechanical person in the world, and I’m a bit dyslexic. Two-dimensional drawings sometimes throw me for a loop. I had a tiny bit of a time figuring which way to point the hose rack. Which is to say, it’s on wrong as I write this. I need to turn it around. 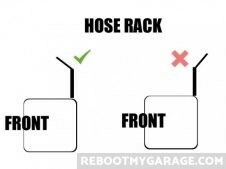 As you are facing the vacuum cleaner, the hose rack should be pointed toward you. I inserted it backwards and didn’t suspect that I’d made a mistake until I tried to use it. The top right port is for blowing (not sucking). The muffler (thank you for including that, VacMaster) inserts into the blow-outward port. Twist it a bit to insert the muffler tab into the input slot. This locks the muffler into place. I noticed at least one reviewer on Amazon didn’t understand why the VWM510 electrical plug doesn’t have a grounding prong. It’s actually explained in the user manual. The machine itself is grounded using something called a double-wall design. I don’t pretend to explain it here, but the lack of a grounding prong is on purpose and not an oversight. The wheel kit is delightfully simple. 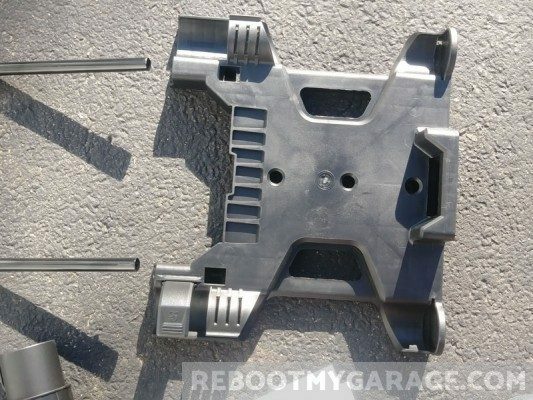 It consists of a frame to push onto the bottom of the vacuum bucket; 4 wheels that insert without extra hardware, and 4 screws to give the bracket some extra hold. Add the casters to the bottom of the frame. Seat the vacuum cleaner bucket into the top of the frame. Secure with the four included screws. Use the tornado image switch to allow the remote control to turn the machine on and off. I misunderstood the power switch toggle designs at first. I thought the straight bar was for dry vacuuming, and the tornado was for wet vacuuming. Actually, you can use either direction for vacuuming, regardless of whether you’re vacuuming wet or dry. The “tornado” is actually radio waves. Use this power button toggle to use the remote switch on the hand-held accessory. 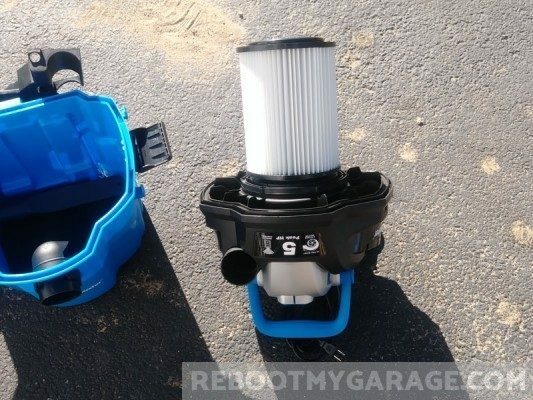 The motor and filter cartridge are hefty and impressively compact. 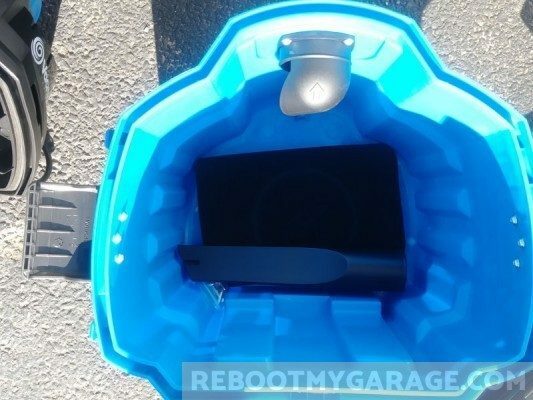 When you lift the motor out of the bucket, the cartridge is installed on the underside. So the machine comes ready for dry vac use. You pull this off and install the foam filter instead for wet vac jobs. The cartridge and foam filter are washable. You actually don’t have to use the filter for dry vacuuming, but you should, as vacuum filters protect the motor from incoming dirt particles. The hoses are 10 ft. and 11 ft. long. Both hoses are plastic, but the 10 ft. “flex hose” has a metal Slinky toy compression and expansion movement. This is the hose you do not use when running the machine as a wet vacuum. The 10 ft. hose is considered “crush proof.” The “flex hose” is not! Together they give you 21 ft. of hose when running as a dry vacuum. Two extension wands add maybe another foot. The machine uses a 1 7/8 in. diameter hose set. 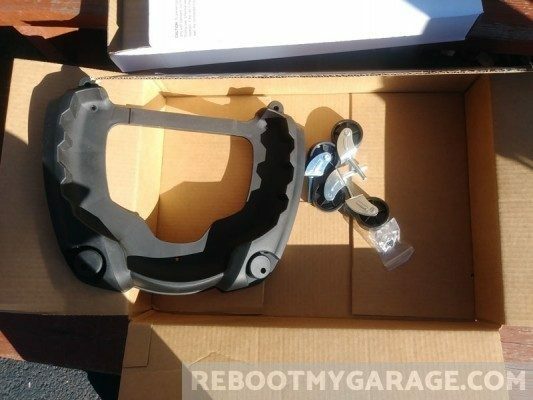 The remote power extension had a plastic piece to protect the batteries during shipping. 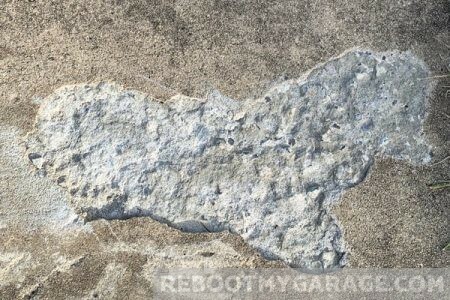 I removed that before installing the vacuum cleaner on the garage wall. The electrical cord is 20 ft. long. 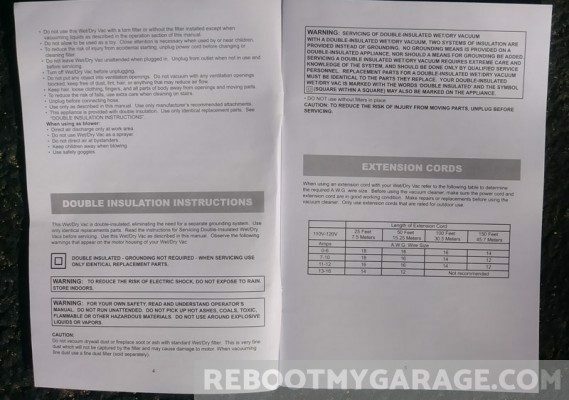 The manual specifically requires that you not use just any extension cord with this vacuum cleaner electrical cord. “AWG” is American Wire Gauge. A higher A.W.G. implies thinner wire. An 18 A.W.G. wire is weaker than a 16 A.W.G. The 16 A.W.G. wire can handle more amps than the 18 A.W.G. wire. 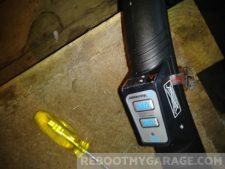 The VWM510 uses 8.5 amps. 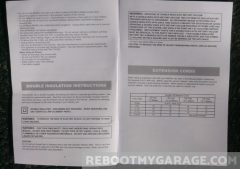 You need to know that when checking the manual for the A.W.G. extension cord size. A 25-foot extension cord should be rated no more than 18 A.W.G. wire size. That means it’s ok to use 18 A.W.G. or lower. 16 would be OK. 20 would not. A 50-foot cord should be not more than 16 A.W.G. A 100-foot cord should be no more than 14 A.W.G. And a 150-foot extension cord should be rated no more than 12 A.W.G. I must have gotten tired by the time I was ready to screw the holding bracket onto the wall. The air was cold, my hands weren’t working that well, and my nose was annoyingly sniffly. So I made two mistakes right in a row while putting the vac on the wall. First, despite all of the calculations I did around how far the hose would go, I chose to install the vacuum at the back of the garage instead of the middle. 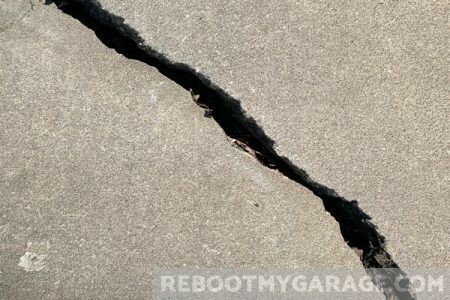 The power is in the back of the garage. 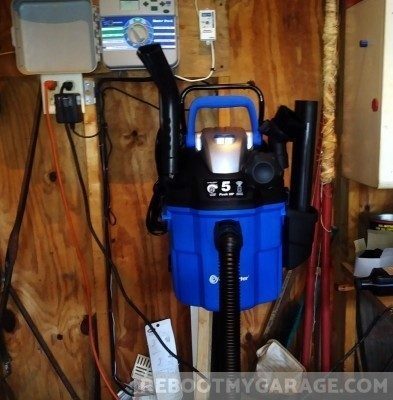 I should have installed the vacuum cleaner in the middle of the garage and used an appropriately sized extension cord to the power outlet. 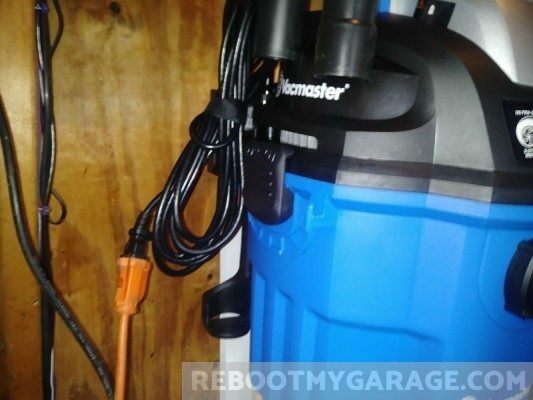 From the back of my garage, the vacuum hose reaches to the doors, but not outside. 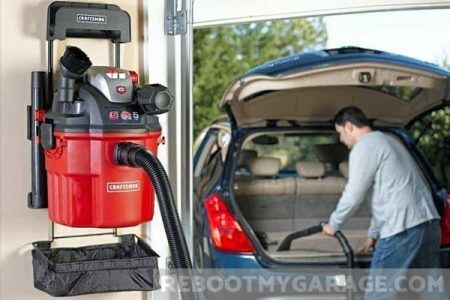 I could not leave the machine on the wall and still vacuum the car in the driveway. Second, I put the mounting screws into the stud without inserting the holding bracket between the screws and the stud. My mind was on the electrical charge strips I had recently put up inside. These required that you put screws in the wall and then hang the charger on them. The vacuum bracket doesn’t hang on the screws. It gets screwed into the stud. So after I put the screws into the stud, I realized that I needed to remove them. That’s when the fun started. The screws refused to budge back out of the stud. 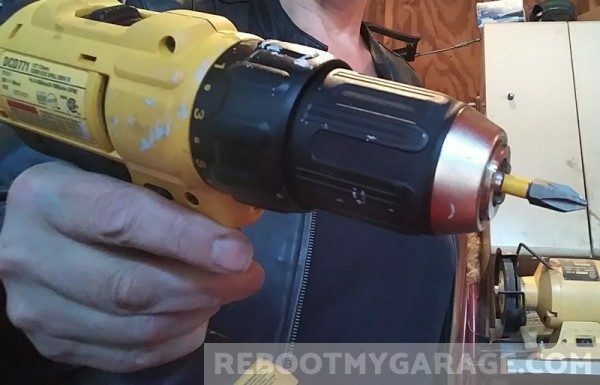 I used the reverse on the power drill. I use various hand-held screwdrivers, and none seemed to be the right size. Finally I found a screwdriver that would turn the screws, but only if I really leaned on it. The bottom-most screw had stripped by this point. There was a similar screw sitting on the table (for no reason). I pulled the bad screw out with pliers. Then I drilled pilot holes with an electrical drill. I put the vacuum holding bracket over the stud, lined up the holes, and screwed it into the wall. I added the assembly bucket to the right side of the vacuum bucket. 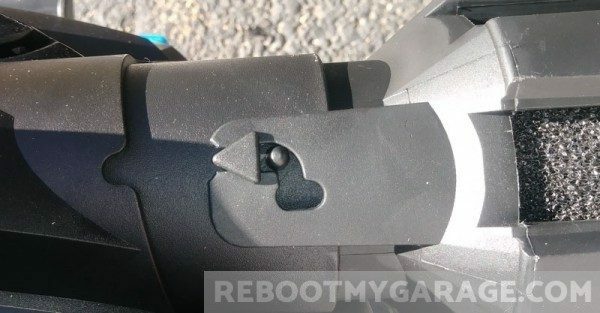 The vacuum cleaner has slots everywhere for the different accessories. Plus the bucket has 1 7/8 in. diameter extrusions to hold the extension wands. It was a bit of a crowded fit. So if you’re following along from above, you know that I installed the hose bracket backwards. By the time I figured this out, I was cold, my hands weren’t working, and I was really tired from fighting the screws that were stuck in the stud. This little machine packs a bunch of accessories into a small space. There’s not really a lot of engineering room left for a backwards hose bracket. I fixed the bracket, returned the machine to the wall, and called it a day. I had cold hands again the day I tested the vacuum. I wanted to use the blower, but the muffler was a bit stuck. I really think if I had put on a pair of gloves that this would have worked out fine. Rather than be practical or fight the muffler, I chose to vacuum some leaves rather than blow them out. I started out with the floor attachment. 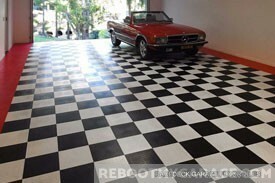 It’s more of a car floor attachment than a garage floor attachment. The leaves were not interested in getting vacuumed by that size of an accessory. I pulled the attachment off. With just a bare extension wand end, I pulled up the leaves in good time. A large wad of tape shot up the hose without issue as well. Then I put the floor attachment back on and cleaned up some sand and dust. 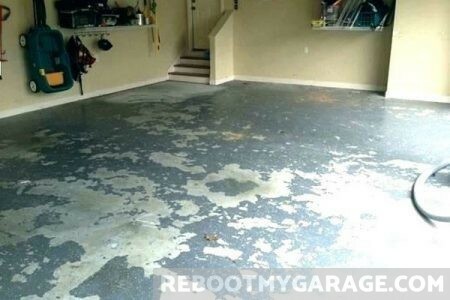 It went well, but I have to give it to the Shop Vac we’re giving away for having a large floor attachment. I might find a larger floor attachment for the VacMaster, I’m sure 1 7/8 in. 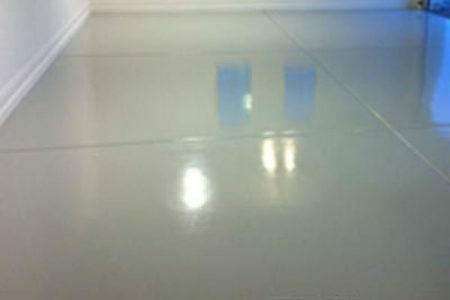 large vacuum floor accessories are easy to find. 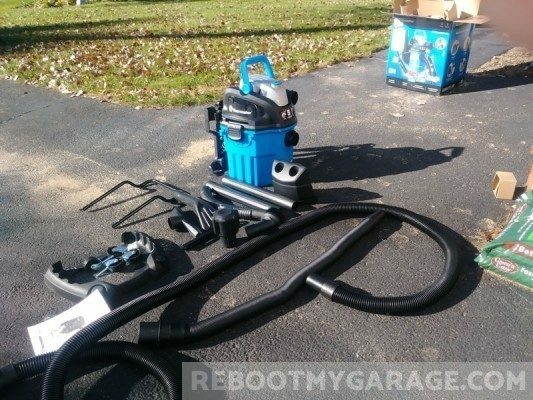 When I move the vacuum to the middle of the garage, the hose will reach 10 ft. into the driveway. I wanted to vacuum the car before I had a chance to move the machine. I decided to unmount the VacMaster for that job. It turned out to be really easy to pull the machine off of the wall. 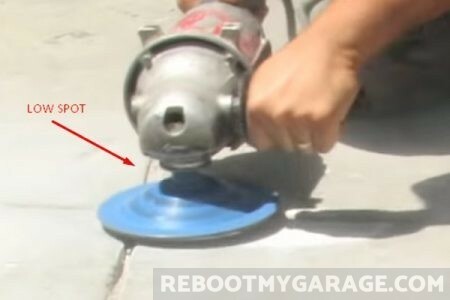 The trick is to unbuckle the bucket from the motor head; and then pull the motor head completely off and out of the way. The bucket will then easily lift out of the mounting bracket. That’s not how the instructions say to unmount the vacuum. There’s a lever in the left side. You are supposed to press and release that before lifting the bucket. My way was easier. I didn’t see the lever. The car vacuuming went really well. The machine is plenty powerful. The accessories are properly sized. And the remote control works exactly as expected. To use the remote control, first you attach it to the end of the hose and extension wands. On the bucket, turn the switch to the tornado wireless signal. Then press the vertical bar button on the remote handle. Using the remote, you can turn the vacuum on and off from the handle. This is nice, compared to walking 20 ft. just to flip the switch. I’m not claiming these are the only user manual facts you need to know. But they did catch my attention as being particularly import. “Do not allow to be used as a toy. ” I’m worried that we have to tell people this. “Do not direct air at bystanders.” Ditto. Use foam for wet, cartridge for dry. Do not mix this up. Empty the tank before using the vacuum as a blower. Always use the dust filter for dry vacuuming or the motor will burn out and Santa will cry. 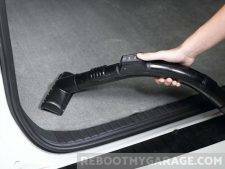 Do not use the “flex hose” for wet vacuuming. I love the remote control as much as I thought I would. That’s a really nice touch. The latches make a satisfying clunk sound when you lock the bucket into the tank. I could blame the instructions for my screw-first and hose rack backwards screw up, but my eyes were watery, I wasn’t wearing my glasses, and I have to say that those were my fault. The floor accessory is smaller than I expected it to be. The machine gave me plenty of power to pick up clunky messes and leaves. It works great in the car. 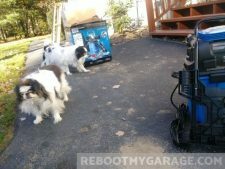 I will move the machine to the middle of the garage (not more than 20 ft. from an electrical outlet, or I will add a proper extension cord per manual instructions). I’ll take some pictures of the wheels too. I’ll run a p.s. to this blog in a week or two. 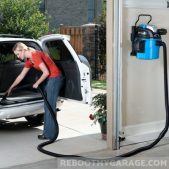 The best vacuum for cars is one that is wall-mounted, has a long hose, has a remote on/off switch, can do wet vacuuming and has wheels. The ONLY vacuum cleaner that fits these requirements is the VacMaster VWM510. Check it out on Amazon now.